The Honorable Governor of the State of Rhode Island was once apprehended for being in Canada illegally to shoe horses. He says that gives him a unique perspective on the issue of illegal immigration and how apprehended aliens should be treated. You have to admit that he's honest. Or was it perhaps a touch of nostalgia for his past life? Rhode Island Governor Lincoln Chafee admitted today in an interview with WPRO "Plain Speaking" blogger and radio personality Bob Plain that he worked illegally in Canada as a racetrack horseshoer...and that his day of destiny came when one of the other shoers at a track turned him in to immigration authorities. As discussion of how to deal with illegal aliens rises to the top of political issues in the United States, no one expected any state would have a governor with firsthand experience with the issue. 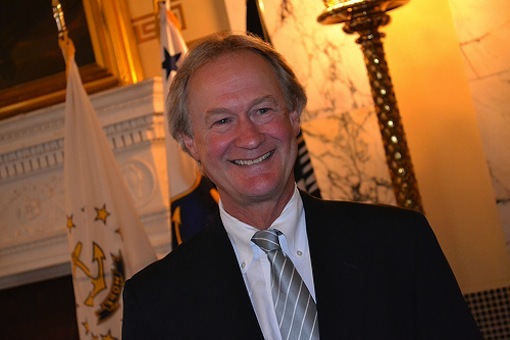 Chafee said he was fined $50 for working in Canada without proper working papers. The experience, he said, is one of the reasons he would like to see a law passed that would allow immigrants in this country to illegally work towards becoming legal without leaving, as he did when he was an undocumented worker in Canada. After graduating from horseshoeing school at Montana State University, Chafee gravitated to the harness tracks of western Canada. He prepared for horseshoeing school by completing his undergraduate college degree at Brown University. In case you're wondering, there are quite a few farriers around the country with degrees from Ivy League colleges. Chafee isn't the only one. Plenty of Ivy League graduates headed to Canada in the 1960s but they went to escape the draft, not to shoe horses. Chafee's illegal migration would have taken place during the 1970s. An interesting footnote to Chafee's story is that his father was a United States Senator when his son was picked up by authorities for working illegally in Canada. Years later, the horseshoer filled his father's Senate seat until he failed re-election on his last attempt. If he was running for that office today, would someone make an issue of his lack of respect for the law? I respect Chafee for his honesty. It's a long way from his arrest as an Ivy League horseshoer in Canada to the news of an illegal Mexican stableworker in Vermont who was arrested two weeks ago when he was a passenger in a car stopped for speeding. His arrest sparked a protest in the normally peaceful Green Mountain State, with a trio of protesters arrested. Vermont has previously espoused a "Don't ask, don't tell" policy toward immigration status. Last year, the state attorney general was quoted as saying his state was "no Arizona". The mandatory federal "Secure Communities" program changes that. Chafee is the latest in a series of governors to speak out on immigration enforcement politics. When he was a US Senator, Chafee proudly displayed his IUJH horseshoer's license in his office in Washington, DC. He split from his longtime association with the Republican party while still a Senator; he left the Senate in 2006. 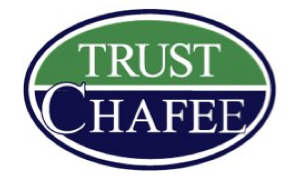 Chafee currently is an Independent--an appropriate stance for a farrier. And he seems to be working in this country legally. What you are seeing is a time-lapse of the radiographic view of a horse going through the process commonly called "rotation". What rotation actually is and which part of the foot is the chicken and which is the egg is perpetually debated. This particular foot is also "sinking" within the hoof capsule. The video was created by Andrew Van Eps, BVSc, PhD, MACVSc, DACVIM of the University of Queensland. Dr. Van Eps earned a PhD while he was researching laminitis at the Australian Equine Laminitis Research Unit under Dr Chris Pollitt. Among the insights Dr. Van Eps' PhD research has contributed to the treatment of laminitis is the efficacy of cryotherapy in the prevention of laminitis. He created the video of the Potomac Horse Fever case during a residency at the University of Pennsylvania School of Veterinary Medicine. At the Sixth International Equine Conference on Laminitis and Diseases of the Foot in West Palm Beach, Florida next month, Dr. Van Eps returns once again to speak. Among his subjects will be suggestions for ways to apply cryotherapy, clinical techniques to prevent support-limb laminitis and his intriguing-sounding lecture, "Lamellar Bioenergetics Studied Using Tissue Microdialysis". You might be interested in reading "Equine laminitis: cryotherapy reduces the severity of the acute lesion" and "Equine laminitis model: cryotherapy reduces the severity of lesions evaluated seven days after induction with oligofructose" by van Eps and Dr. Pollitt, originally published in 2004 and 2009, respectively, in the Equine Veterinary Journal. He's probably forgotten all about this video. But to anyone dealing with laminitis, the question of whether or not rotation is inevitable in a given horse remains a paramount concern. How many horses technically experience laminitis and have damaged laminae, but have minor rotation or none at all, and why is there such variation between horses? How many horses have bouts of laminitis that their owners never even notice? Is it still laminitis if no one notices but the farrier, the next time the horse is due to be trimmed or shod? And what is rotation? Is the deep digital flexor tendon, which attaches on the underside of the coffin bone, actually pulling up and back on the bone as the laminae at the toe loosen their hold on the bone, as we've been taught, and as this video would so nicely illustrate? Or is it the weight of the horse on the compromised structures, compounded by unusual posture, that encourages a combination of those forces to work in concert? 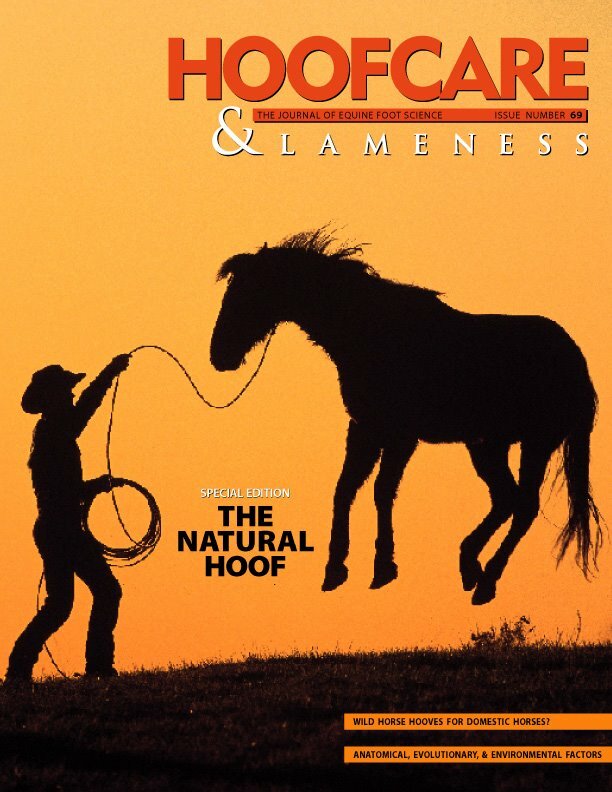 Lead author Gordon Ramsey was kind enough to send his paper and this section begs to be highlighted; using a Finite Element analysis model, Ramsey calculated forces on the proximal hoof wall at the toe when the heels are raised, as recommended in some laminitis therapy regimen. Extrapolating from that finding, he challenged the mainstream concept of coffin bone rotation in laminitis. Please note that the author is from the University of Auckland in New Zealand and so uses "lamellae" instead of "laminae" in his text; instead of referring to raising the heels of the foot, he refers to mechanically altering the palmar angle of the coffin bone. It's food for thought whether measurements of heels and coffin bone palmar angles are interchangeable. "The first stage of structural failure in a laminitic hoof involves a stretching of the laminar junction (Pollitt 2007), with rotational displacement occurring subsequently. This seems consistent with a mode of failure that begins at the most loaded proximal part of the lamellae, as predicted by this model, with rotation only occurring after the lamellae have been weakened. "It has been proposed that rotational displacement of the distal phalanx, as a sequel to weakening or failure of the laminar junction, is a result of the forces imposed by the deep digital flexor tendon (DDFT) and leverage of the dorsal wall on the ground during breakover (Hood 1999). Experimental results have shown that in laminitic ponies the DDFT force is zero for the first 40% of stance and only approaches a normal value near the end of stance, but that the peak vertical ground reaction force (GRF) is only reduced by 13 percent compared to normal ponies (McGuigan et al 2005). "Since the peak lamellar load, predicted by this model to occur at the proximal (not the distal) region of the laminar junction, is more strongly influenced by the GRF than the DDFT force and does not occur during breakover, then this mechanism seems unlikely. "An alternative proposed mechanism is that the digital cushion and the region of the attachment of the DDFT are a fulcrum about which the distal phalanx rotates (Coffman et al 1970). As both the DDFT and the digital cushion are soft tissues, it seems unlikely that these could provide sufficient support. 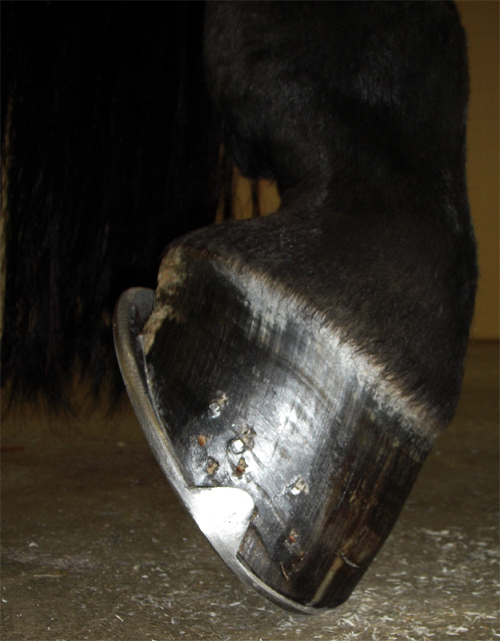 "However, if the hoof has contracted heels or ingrown bars (Strasser 1997), then these could provide support for the palmar processes to act as the fulcrum for rotation. This could explain why in some hooves the distal phalanx rotates but in other cases, where this fulcrum perhaps does not exist, it only displaces vertically." Join in the discussion at the Laminitis Conference, October 29-31. The early registration discount ends soon! Shoeing a Shire horse isn't easy. Neither is describing the process in a little more than a minute but The Farm's "Head Girl" Emma Warner did it. Yesterday The Hoof Blog commiserated with a researcher who had to explain insulin resistance and its role in equine laminitis in less than three minutes. Who knew an academic could avoid all the big words and cut to the chase? Today I was thinking that it's equally hard to explain what a farrier is doing as s/he shoes a horse. And I found someone who did it in a minute and a half. "Head Girl" (that's British for horse manager) Emma Warner had some very good video editing behind her voiceover to make it possible. And in doing it, she manages to avoid many of the cliches and misused terms that many journalists and broadcasters inevitably--and understandably--garble. Farrier Will Hellyer is hard at work on one of the Shire horses at the National Trust’s "MyFarm" project at the 2500-acre Wimpole Estate in Cambridgeshire, England, where over 250,000 visitors a year get up close and personal with farm animals, including many from rare species, on a "real" working farm. They also have the option of joining the farm and can become virtual decision-makers on how the farm is run. It's a very interesting way to use the Internet, and would be a great model for a show or racehorse stable, too. I became aware of the farm in July when they set up a web cam in the stall of a Shire mare who was about to foal. I thought it would be exciting for people to follow the birth and encouraged people via Twitter to tune in. The Shire is one of two native heavy horse breeds in England; the Suffolk is the other. Shires are traditionally shod with toe clips. Photo by Lars Lundqvist. It turned out to be something quite different than what any of us imagined. The foal never took a breath after it emerged from the womb and the experience of watching the process turned out not to be the idyllic, joyful one people expected, but rather the hard, cold realism of life (and death) on a real farm, after all. The farm said that 800 people were watching at the time. Watching how the farm handled the publicity over the foal's death was interesting, as the public expressed a wide variety of opinions and reactions, thanks to the open book of social media. The farm seemed to post any and all comments, and take the critical ones in stride. Imagine the challenge laid down by the University of Queensland to its graduate researchers: give a three-minute presentation encapsulating your doctoral work. Tell an audience of everyday people from all walks of life why it matters, what it's all about. But keep it short. Can an Australian laminitis researcher describe equine metabolic syndrome in that short amount of time--using only one slide? 3-2-1...talk! If you're an entrepreneur, a job seeker, self-employed or just someone who doesn't want to be left in the dust of this ever-changing world, you have to have to an elevator speech. Once all you needed was a firm handshake, and a spare business card in your wallet for when you met someone. Now you need to be able to tell him or her what you do with your life and why you do it in just a few words. You need to be able to get the message across that you're special and you're interesting and you're worth knowing/hiring/considering, and you need to say exactly why--all in the time it would take to ride a couple of floors on the elevator of a hotel or office building. When that elevator door opens, your speech is over. Yes, you're saying...But then there are academics. And forget engineers. Have you ever asked a researcher or engineer what he or she actually does? I know what you're thinking: Maybe there are some elevators in some coal mines in some Third World countries that would take long enough for a researcher's speech to get to the point--if there is one, that is. But things are changing. We live in an age of pecha-kucha, the PowerPoint challenge to present your idea in 20 slides that change every 20 seconds, whether you're ready or not. It's the age of the "unconference". And the two-minute video rules, thanks to the way that YouTube has reset our attention spans. So imagine the challenge laid down by the University of Queensland to its graduate research community: give a three-minute presentation encapsulating your doctoral work. Tell an audience of everyday people from all walks of life why it matters, what it's all about. But keep it short. And if you get your message across? You could be the winner. Last year, Melody De Laat answered the UQ Three Minute Thesis competition challenge with a topic related to her thesis: The Investigation of Insulin-Induced Laminitis in Horses. Her research at the Australian Equine Laminitis Research Unit (AELRU) focused on how elevated insulin levels, which occur as a result of insulin resistance, damage the sensitive lamellar (laminar) structures of the horse's foot. And she had to do it on a huge stage, in an even bigger theater, in front of people who knew nothing about horses' feet, let alone about laminitis or insulin resistance. “Insulin resistance is an increasingly common problem in horses. The lamellar failure, which is known as laminitis, that results as a consequence of the elevated insulin levels in the body is a painful and debilitating condition,” Melody said confidently. The Queensland competition was so well-received that it has been extended to other national and international universities in Australia and beyond. Master of Ceremonies for the event is the award-winning science writer and broadcaster with ABC Science Online, and regular judge on Australian ABC TV's The New Inventors, Bernie Hobbs. I hope you enjoyed Melody's equivalent of her elevator speech. She advanced to the finals, and there are a lot more people in Australia who know a little bit about laminitis thanks to this competition and Melody's PhD. And--Oh! Is this your floor? 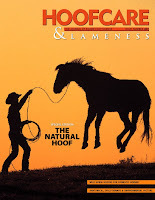 One of Melody De Laat's research breakthroughs on metabolic laminitis was featured on The Hoof Blog on July 1, 2011. If you'd like to learn more, Melody De Laat will be one of four doctoral and post-doctoral researchers from the Australian Equine Laminitis Research Unit (Simon Collins, Melody De Laat, Brian Hampson and Andrew Van Eps are the team) who will accompany AELRU director Chris Pollitt to speak at the 6th International Equine Conference on Laminitis and Diseases of the Foot in West Palm Beach, Florida October 29-31. Dr. George Platt has died. The legendary veterinarian who spent most of his career fighting the disease of equine laminitis suffered a stroke in late August and died this afternoon. If you have ever seen, or touched, or made or used a heart-bar shoe, George Platt had a part in it. 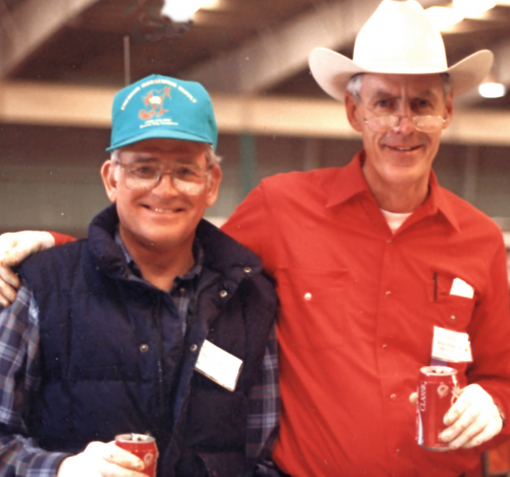 The Texas veterinarian teamed up with horseshoer Burney Chapman in the 1970s and together they experimented with treatments for laminitis. They found the heart-bar shoe in an old textbook and gave it a try; the rest is history. That history was recorded in 1984, at the 30th Annual Convention of the American Association of Equine Practitioners. Platt and Chapman presented the heart-bar shoe as the centerpiece of their treatment protocol which they documented as successful in rehabilitating a long list of cases referred to Platt by insurance companies. George Platt's specialty, for many years, was answering the challenge of bringing these high-profile racehorses or show horses back from the near-dead. A broken neck in a skiing accident slowed him down for a while and he made a comeback as a lecturer and clinician because he felt the need to keep the heart-bar shoe front-and-center after Burney Chapman's death, and to clear up many of the misunderstandings about its use. But he ended up back in practice in the mountains of Colorado, where he told me he intended to just be a "ski bum". But he couldn't resist working on horses. A few years ago, George posed for an over-exposed veterinarian fundraising calendar for an animal shelter in Vail. He was at least twice the age of most of the vets who posed--but he stole the show. He received the "Veterinarian of the Year" Award this year from the Colorado Veterinary Medical Association, and it was one of many accolades to add to his long list. 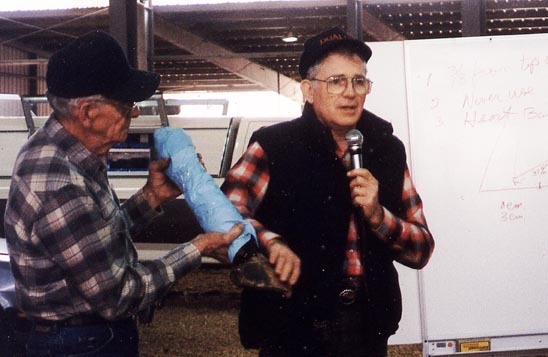 Dr. George Platt (right) with farrier Eddie Watson (left) explaining heart-bar shoes at the 1992 American Farrier's Association Convention. 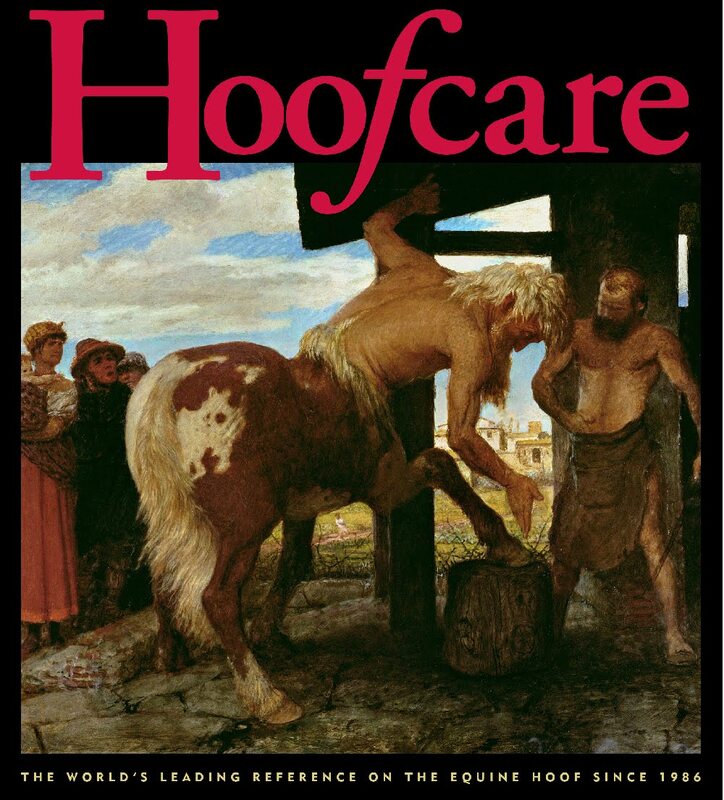 Their collaboration sent Platt off to write a paper for Hoofcare + Lameness on using heart bar shoes for heel pain, which was quite a radical proposition in those days. In looking through a file of letters from him, I'm struck by how many times he said "Just kidding! ", both as he wrote humorously and as he spoke. The last letter I received from him is undated. It says: "This is it: I can't explain how to fit a heart bar but I can show anyone how to." And that's what he did. I was lucky to have George Platt as a friend. 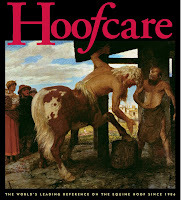 He was a staunch and generous supporter of Hoofcare Publishing; all his contributions, of course, were about heart-bar shoes. I have to say that he, as much or more than any one individual, changed the course of the way that farriers and veterinarians work alone and together when he teamed up with Burney Chapman. People are always quick to give George Platt credit for the heart-bar shoe because he was the very first to lecture on it. He and Burney Chapman did much more than wake a horseshoe up and dust it off: They either launched the beginning of a new age or they opened a Pandora's box. Even 25 years later, it is too soon to tell which, but how many horses have benefited in the meantime? George Platt wasn't one to sit around and wonder what the historians would have to say about him and his ideas on laminitis. 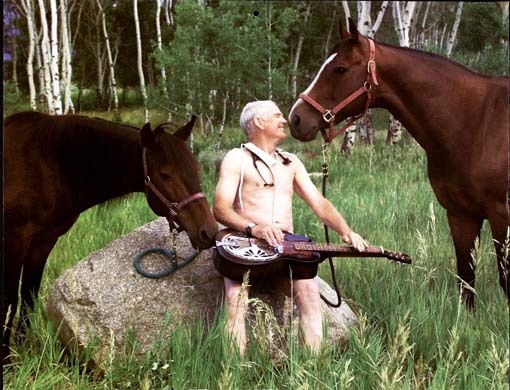 He knew what he'd accomplished in his decades of trying to stop laminitis from taking horses' lives. He might not be able to explain it, but he could show you how it's done. And he did. Thank you, George Platt. The Hoof Blog's ongoing series of occasional "guest bloggers" continues today with a timeline narrative about product development, based on a series of correspondence over the past few weeks from our friend Garrett Ford. I've watched Garrett Ford build an empire based on the original EasyBoot over the last 25 or so years. His company, EasyCare, now makes 18 different kinds of hoof boots and, perhaps more importantly, sets a standard for continual innovation and product development. I can't keep up with their new products. Invention is part of being American. Over the years, EasyCare has probably inspired hundreds of people to try their hands at building a better mousetrap, hoof boot, horseshoe or some piece of tack that will help a trail horse move more comfortably or safely across the landscape. This summer, Garrett moved his company into new territory: he pursed his desire to race a horse in a product his company could design and manufacture. What started out as a curious R+D project led him to tinker with a lightweight hoof boot until it ceased being called a boot and for all intents and purposes became a glue-on shoe. The problem: the racing stewards at the track vacillated over whether or not it was legal racing equipment. There's no question that the decision must be respected, but sharing this story will show everyone what entrepreneurs go through and what some of the upfront costs and time expenditures are in getting a new product to the market. When Garrett told me the saga of his shoe, I smiled because I wasn't surprised. Almost every hoofcare innovator runs into a brick wall of some type sooner or later, when and if the product is to be used on certain types of show horses or at the track. I've seen some people sail over the brick walls, and I've seen others bang their heads against them time and again. I've also seen wonderful products abandoned, never to see the bright lights of a store shelf, simply because the developers didn't have the resources to jump through the hoops that lay waiting for them on the other side of the brick wall. Unfortunately, Garrett ran into his brick wall sooner instead of later. Fortunately, he is not building these shoes one at a time in his basement. He's not mortgaging his house to finance an injection mold modification. He has the means and the resolve to keep modifying and keep trying until he really does have his own unique type of all-plastic glue-on boot/shoe. If you ask me, the brick wall was a blessing. Had Garrett Ford merely whipped up four prototype glue-on shoes, glued them onto a racehorse and proceeded to the owner's enclosure at the track, that might have been the end of it. He might have rested on his easily-earned laurels and retired the racehorse to become an endurance horse, as was his original plan. And he might never have thought about turning his prototype into a truly usable product that could potentially be of value to horses all over the world. 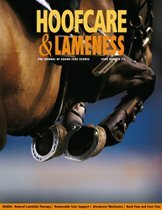 Parts of this post in the Hoofcare and Lameness Hoof Blog were published in a different form in the EasyCare newsletter and/or on the company blog under the title The Horse That Wasn't Allowed To Race. Dual copyright from both companies protects this post. EasyCare hoof boots have been used in almost every horse sport, but have yet to make an impact in racing. Until recently, hoof boots have been much too heavy and bulky to allow a race horse to be competitive. So when the Easyboot Glue-On was developed, Garrett decided to campaign an Arabian racehorse in a modified version of it. And that's where our story begins. What Could the Glue-On Do for Racing? Why bother, you ask? 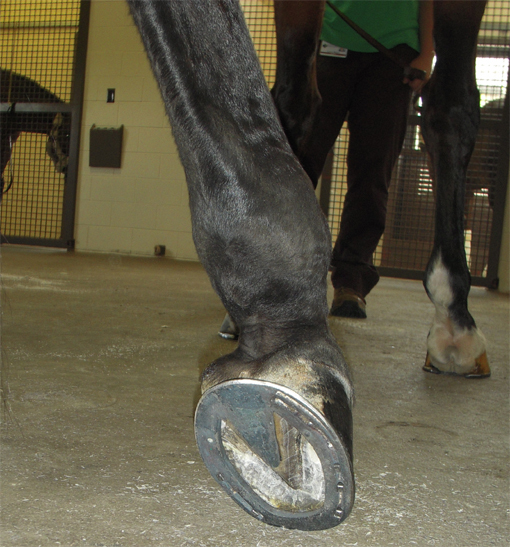 Life on the race track presents challenges to the equine hoof. Many racehorses have challenges with brittle walls, quarter cracks, tender feet, lack of support, and contracted heels from continuous shoeing and training stress. When a racehorse rips off a shoe and loses hoof wall, that wall has a difficult time holding nails and, as a result, may miss conditioning and races. Track horses are subjected to pounding workouts and as a result are prone to injury. For these reasons, and probably many more, the idea of a better shoe for racehorses is fertile ground for any innovative thinkers who spend much time at the racetrack. 8. bring an affordable glue-on solution to the track. In the past, Garrett has tried unsuccessfully to convince racehorse trainers to use hoof boots for flat track training. 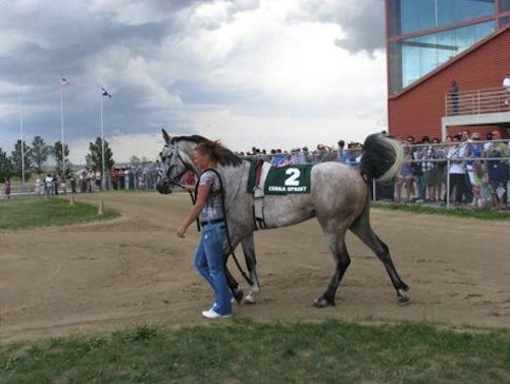 To set his program in motion, he purchased a racetrack Arabian named Clunk. His plan had four steps: 1) to pull the aluminum racing plates he was wearing when purchased; 2) to improve the trim on his feet; 3) to condition him in the hills and then 4) to take him back to the track and race him in the new Easyboot Race shoes. 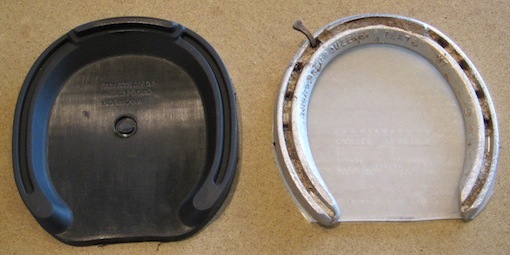 Weights of the aluminum race plates and the modified Easyboot Race shoe were taken after the Race shoes were modified. The average weight of the aluminum plate was 4.5 ounces. There were variances of + .1 ounces and - .1 ounces. These shoes had been worn in one race, on a soft racing surface, and exhibited little to no wear and tear. They were removed within three hours of finishing the race. 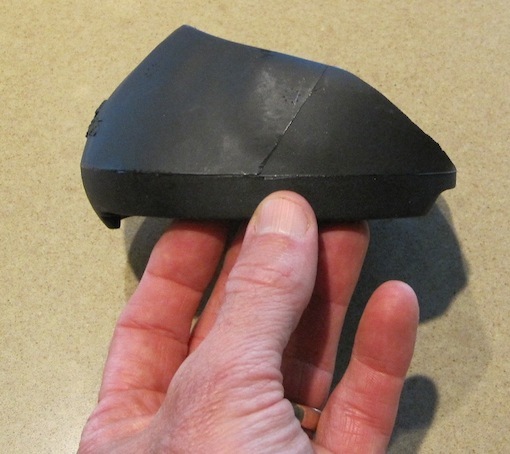 The average weight of the reconfigured EasyCare Race shoe was 5.5 ounces. After adding the appropriate amount of glue for proper adhesion, the final weight was 6.0 ounces. The variance was + or - .15 ounces. During this process Garrett met with the stewards (race officials) at the racetrack. They discussed the new shoe and the prospect of racing Clunk in the new design on August 7th, 2011. Garrett said that the stewards were initially very receptive to the design and thought it could be beneficial for many reasons; they asked to see Clunk do an official workout the week before the August 7th race. Clunk's race shoes were applied (glued) Tuesday August 2, 2011, in anticipation of a workout in front of stewards on Wednesday August 3rd. Garrett reported that Clunk did a flawless workout in front of the stewards, track vet and several jockeys; Clunk’s jockey was reported to be very impressed and said the horse felt more confident and stable. The track vet had no objections and saw many benefits that could help track horses. The stewards, however, subsequently changed their opinion, informing Garrett that Clunk would not be able to race on August 7th if wearing the Easyboot Race Shoes. They were unable to give a reason or cite a rule in support of their decision. 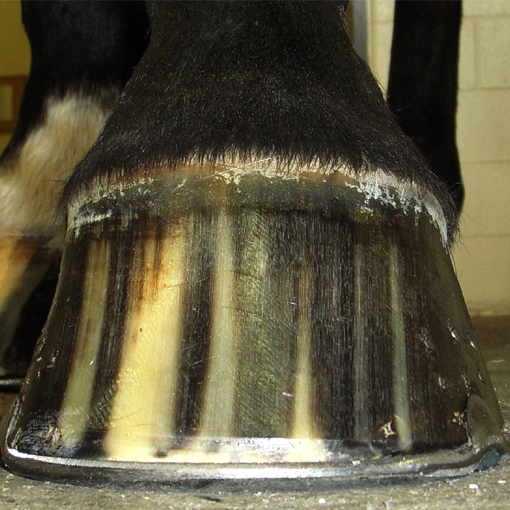 On Friday August 5th, Garrett filed a formal appeal and asked the stewards and director for a reason and rule that would not allow Clunk to race in the new EasyCare hoof wear. The director responded with a written response, stating that our new shoe went against rule number 7.608: "7.608 - Bar plates may be used only with the consent of the Division Veterinarian. The commission may limit the height of toe grabs for any breed at a live race meet. 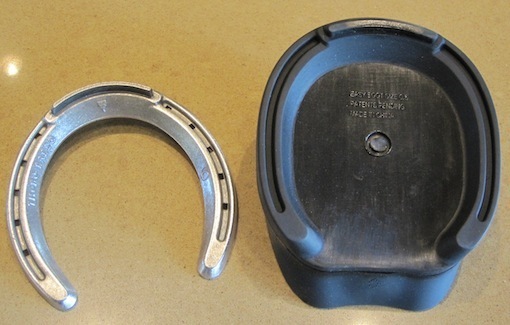 Toe grabs with a height greater than the maximum set by the commission, bends, jar caulks, stickers and any other traction device worn on the front hooves of horses while racing or training on all surfaces, are prohibited. The horse shall be scratched and the trainer may be subject to fine for any violation of this rule." After the decision, Garrett could have simply removed Clunk's Easyboot Race shoes and raced him in aluminum plates but decided instead to scratch him and stick to what he had set out to accomplish. He quickly finished a new mold that was exactly the same shape of the aluminum plate removed from Clunk's hoof after he was purchased. Although Clunk was not allowed to race on August 7th, he remained entered in the August 21st feature race. Garrett believed that he could modify the Easyboot Race to be an exact copy of an aluminum plate and the stewards could not say it violated the 7.608 rule. On Wednesday August 17th the racing director informed Garrett via e-mail: "Please be aware that we will be unable to provide you with suggested changes to the product to get it to conform to Commission rules. No matter what changes you suggest, it will not change the fact that the device is a traction device prohibited under the Rule 7.608." Unless EasyCare knows the portions of the shoe that the track officials believe don’t conform to commission rules, the email is correct: he is unable to make changes. Polyurethane glue-on racing shoes are already out there and being used by some of the best horses and trainers in the sport. Breeders Cup races and major stakes races all over the world on all types of surfaces have been won by horses wearing next-generation glue-on hoofware. Big Brown ran to victory in the 134th Kentucky Derby wearing glued-on Yasha plastic-aluminum hybrid shoes. 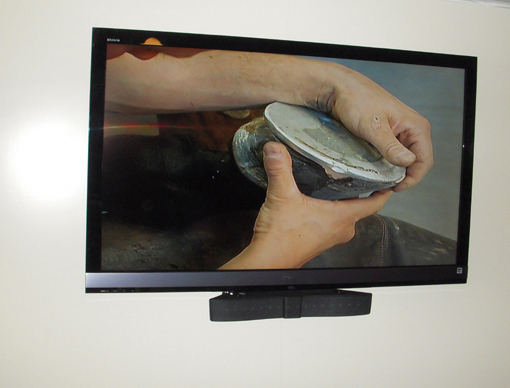 Shackleford won the 2011 Preakness Stakes wearing glue-on Polyflex shoes. Overdose set a track record on the turf in Germany wearing glue-on Sigafoos shoes. Clunk had been at the track and training in the Easyboot Race shoes since August 8th. Garrett decided to scratch Clunk from the August 21st feature race rather than change his equipment the day before the race. Next, Garrett made plans to attend a September 13th racing commission meeting. “We have indicated that we would like to be part of the meeting as we would like to do everything possible to hit the ground running for the 2012 race season at this track,” Garrett wrote. "In the months to come, I hope to pull some of the horses with foot issues off the slaughter-bound truck at the track and fit them in the new Easyboot Race shoes. I would like nothing more than to show that a horse heading for a processing plant in Mexico was saved, turned around and could win races again in Easyboot Race shoes. "We will continue to persevere and believe the track officials will accept the shoe. "At this point in the process, I am turning to the Hoofcare & Lameness community of top professionals and the benefit of this blog's reach into the global mainstream horse industry to ask for consultation. 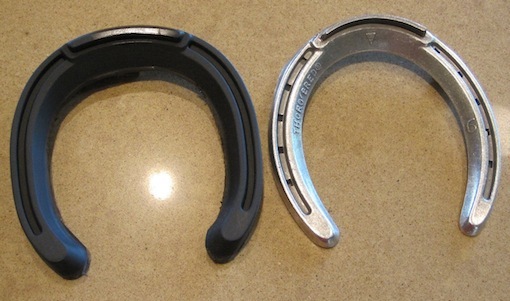 Do Hoof Blog readers believe the racetrack industry could benefit from more choices in alternative hoof wear and more urethane shoe options? Do you have a horse or know of a horse that would be a candidate for the new Easyboot Race shoe?" 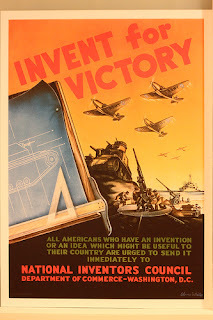 What are your thoughts about the process that inventors and entrepreneurs go through? Please click on the comment button and leave your thoughts here. If you don't know how to leave a comment, send Fran an email and I will post it for you. From Drs. Lisa Lancaster and Robert Bowker and the Equine Foot Laboratory at Michigan State University College of Veterinary Medicine: Just click to order yours today! Farrier Travis Burns recently received a promotion to faculty level at Virginia-Maryland Regional College of Veterinary Medicine. Travis is now "lecturer and college farrier" at the Blacksburg, Virginia campus. From the Hoof Prints newsletter of the veterinary college's Equine Field Service: "Travis Burns, hospital farrier, was recently promoted to faculty status in recognition of his important contributions to the college’s clinical, instructional, and outreach programs, particulary in podiatry. It is great to see our faculty and staff rewarded for their efforts." Travis joined the university in the winter of 2010 and has been helping Professor R. Scott Pleasant, DVM, MS, Diplomate, ACVS create what is shaping up to be an innovative and energized equine podiatry unit at the vet school. Travis's background includes a Bachelor of Science degree in animal science from North Carolina State University, a stint at farrier school, and completion of the unique professional internship program at the Forging Ahead multi-farrier sport horse practice in Round Hill, Virginia. While with Forging Ahead, Travis had exposure to podiatry cases when assisting Paul Goodness in his work as consulting farrier at the Marion du Pont Scott Equine Medical Center, which is affiliated with the university. Obviously, Travis liked what he saw; he seized the opportunity to specialize in podiatry. He and Dr. Pleasant will hopefully inspire others to be creative about career specializations and the initiative to develop forward-thinking programs where once none existed. There's a saying that gets tossed around a lot in leadership-by-design books. It's often spouted from the stage by commencement speakers. The words, attributed to Sir Issac Newton, appear on the edge of every British two-pound coin. Newton is said to have said, "If I have seen a little further, it is by standing on the shoulders of Giants." I'm sure you understand precisely what this saying means. We have progressed further than those who came before us, because of their tremendous height--height in humanity, height in perseverance, height in sacrifice or bravery or intelligence or ability. And, in some way, the giants gained their height too by the act of lifting up the next generation, sometimes by not even acknowledging that that is what they were doing, even as they did it. For the most part, these giants exist in people's memories. Each of us knows who the giants are--or were--in our lives. But sometimes we see the ghosts of the giants, or I do. I remember seeing a ghost at farrier Eddie Watson's funeral in Virginia, an overflowing funeral home with three chapels--all three filled with the three F's of Mr. Watson's life: friends, family and farriers. At the Hunt Club reception afterwards, there was a tiny lamp; he had forged the beautiful base. It burned brightly, though it was the middle of the afternoon, and the paper shade was a warm color. As people jostled around, that little light kept burning. I think I know why it was there, and why it was turned on. Another time was when the horseshoers at Saratoga lost several members of their fraternity in one year. To commemorate the loss, they set up an anvil and a tree as a little memorial garden outside the blacksmith shop behind the Oklahoma Training Track. A lot of people came to the dedication ceremony, all for different reasons, and in memory of different people. We stood and stared at a little sapling tree, and beyond. A tree was planted in Saratoga. I felt that way in 2008, when Cornell's farrier shop was remodeled and then-resident farrier Michael Wildenstein sank into the concrete of the floor shoes made by the instructors who had come before him. And he made sure that Buster Conklin, the only one still living (at the time), came in to have his photo taken in the new shop with his shoe in the floor. We all have ways of remembering people who've made a difference in our lives, and we carry them around in and with us in different ways. But sometimes people care enough, and are creative enough, to make an extra effort, to call out for a gathering or a photo session or a special place to set up a little lamp, because it's important. Saturday afternoon will be one of those times. The senior statesman of Massachusetts horseshoers, Mr. Bob McCarthy, died last year. His wonderful blacksmith shop in his little town has been torn down. A forge stood in that spot for almost 200 years but now there's a parking lot. But someone cared enough to do something to mark the spot where Bob spent his days--spent his life, in fact. We all had to start somewhere, even Myron McLane, and he was lucky enough to start with Bob McCarthy. Myron bought Bob's 225-pound Eagle anvil years ago when the shop closed, and now has prepared it as a monument on a special granite base, surrounded with a mosaic of inlaid horseshoes made by farriers who were influenced by Bob, and who cared enough to make a shoe in his memory. There will be a few of Bob's shoes in there as well. The town has approved the monument and the dedication. Bob's anvil will be dedicated at 12:30 on September 17 on Janes Avenue in Medfield, Massachusetts. Everyone is welcome. Just ask anyone where Bob's blacksmith shop used to be. It's the kind of place that, even though it's gone, is still there in a lot of people's memories, and now an anvil will mark the spot. It doesn't seem so long ago that a giant stood in that very spot, and behind that very anvil, the one that Bob's father bought in 1931. If Bob stood there on Saturday and looked down, he'd see the beautiful workmanship of the farriers who stand today on his shoulders, farriers who haven't forgotten who helped lift them to where--and who--they are today. The Alltech National Horse Show’s press release was just full of news. First of all, the parapetetic National Horse Show has moved again. After 100 or so years in the middle of Manhattan and the most glamorous setting imaginable, the show picked up stakes from Madison Square Garden and moved first across the Hudson River to the Meadowlands in New Jersey and then to Florida for a run, then back to New York, but to Syracuse this time, the show’s most recent venue. Now it’s on to Kentucky, where the great show has found a home at the Kentucky Horse Park's indoor arena and a star-billing date on the fall hunter/jumper competition calendar. And the show not only found a home in Kentucky--it found a title sponsor. It is one whose name we already know well: Alltech. When the 128th Alltech National Horse Show opens at the Horse Park on November 2, it will have a new group of farriers backstage. The show has formed an official alliance with the Rood and Riddle Equine Hospital, just down the road from the Horse Park. The alliance extends to Rood and Riddle providing the show farriers, the show veterinarians, and even the show equine pharmacy. "We're planning to make a big effort," said Rood + Riddle's Scott Morrison DVM, head of the hospital's unique podiatry center. "We want to make certain that the competitors at the show are satisfied with their foot care." Morrison said that the show is "only" expecting to attract about 360 horses, which he thought his team could easily handle. He said he expects two of the clinic's farriers, Rodney King and Jeff Henderson, will provide the bulk of the show service, and that he would be on call as well. "We're looking forward to it," Morrison continued. "We'll get it done!" The first week in November will be a busy time in the state of Kentucky. The fledgling horse show will have to compete this year (and only this year) for the attention of people in the Bluegrass because the Breeders Cup will run on Friday and Saturday at Churchill Downs. Morrison remarked that one of the podiatry center's biggest consulting clients, Irish horse trainer Aiden O'Brien, will be bringing several horses to Kentucky for the Breeders Cup, and Morrison expects to be on call for any horses that need his help at both the National Horse Show and the Churchill Downs events that weekend. Is this the first time that the official farrier service at a horse show is to be provided by a veterinary hospital? Most likely, it is. But like the location of the horse show, the role of the show professionals is obviously changing as well. It may also be the first time that a group practice has provided all the veterinary services for an event of this magnitude. The original National Horse Show was first held in 1853 in Springfield, Massachusetts and attracted 500 horses. (Engraving published in Gleason's Pictorial, 1853). After the current version of "The" National Horse Show began in New York in 1883, the show featured a 14-mile endurance race through Manhattan for military horses; it finished in the show arena. At Rood + Riddle, both veterinarians and farriers are employed under the same roof in the pursuit of making lame horses sound and keeping sound horses that way, thanks to the podiatry center building. The unassuming building tucked behind the main hospital sometimes resembles a swarming ant hill of humans, trucks, trailers, vans and horses: each professional may have clients booked into the podiatry center for out-patient procedures or trimming and shoeing, and the staff come and go from the center throughout the day. Horse owners haul their horses from any number of states for consultation or for regular periodic treatments and shoeing. A normal staff of four veterinarians and at least three farriers, plus interns, apprentices, technicians, administrators and helpers make up the staff on a typical day. The vets and farriers may work all or part of the day on the road in service to clients in the Lexington area, or be busy with cases at the podiatry center or with hoof-related concerns of patients in the hospital. Rood + Riddle's podiatry center offers off-site referral services so several staff members acrue some of the highest numbers of frequent flyer points in the entire horse industry. Other cases are handled by reviewing radiographs, photos and videos via the Internet or Federal Express. Rood + Riddle operates a satellite podiatry center at The Sanctuary, an equine rehabilitation facility in Ocala, Florida, and the staff regularly attends to clients' horses in the Wellington, Florida area during the winter months. In addition, the vets and farriers all seem to evolve into educators after they join the staff, and are involved as clinicians and lecturers at educational events all over the world. Most people connect Rood + Riddle with the Thoroughbred racing and breeding world of Lexington, but the clinic obviously has a burgeoning sport horse practice embedded behind its racehorse reputation and address. "Rood + Riddle is extremely pleased to serve as the Official Veterinarians and Farriers for the upcoming Alltech National Horse Show,” Dr. Tom Riddle, co-founder of the hospital, said in the press release. “Rood & Riddle’s participation in both the World Equestrian Games and the National Horse Show underscores our practice's commitment to the sport horse." Rood + Riddle was a sponsor of last year's Alltech FEI World Equestrian Games, held at the Kentucky Horse Park, and the clinic served as the official veterinary hospital for that event, with staff vets serving at the Horse Park. 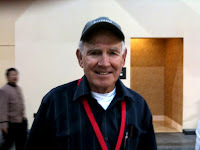 At WEG, farrier services were provided by the American Farrier's Association. About the show: While historically the National Horse Show included Nations Cup international show jumping, gaited horses, fine driving and even classes for fire and police horses, the Kentucky version of the show will be an indoor AA-rated hunter, jumper and equitation over fences extravaganza. The show, as always, will host the finals of the ASPCA Alfred B. Maclay Finals in equitation. 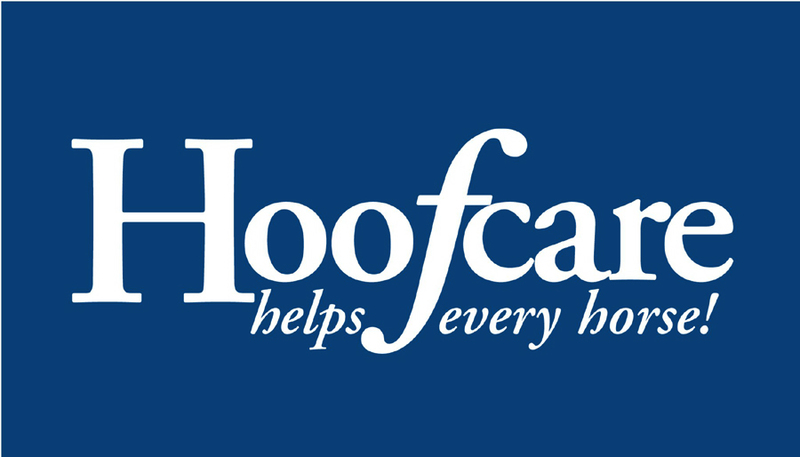 NOTE: Hoofcare + Lameness would like to compile a list of farriers who have served in the capacity of official farrier to The National Horse Show. If you can help with this list or have old programs with information, please email Fran Jurga. As it turns out, farriers have played a big role, historically, in the show, and this seems like a good time to research more history.